We took a left turn somewhere, and never really got back on track. Last week I could not get the Beastie Boys’ song “Girls” out of my head, and for good reason. A company called GoldieBlox produced a great viral video that used the song as part of the sales hook. There’s been talk of lawsuits because GoldieBlox didn’t seek permission to use the music, and now the video has been changed to circumvent any future legal actions. GoldieBlox should know better when it comes to using music, even if it’s a parody of some sort. The legal actions have caused as much, if not more, of a stir than the original video, which is a shame in my mind. The video checked off a lot of different boxes for me, and I was very impressed. I was genuinely excited for the girls in the video because they utilized every part and object in the house to build a Rube Goldberg machine to change the channel on the T.V. Great stuff. It made me go to the website and check out their product, and that is where I was let down. The product was ok. It’s basically a new version of Tinker Toys (for those that remember), and I have no issues with that. Tinker Toys were great to me and I had loads of fun building with them as a youngster. The issue was they were still “girl” coloured- Lavender, yellow, pink and powder blues. Yes, the pink is used to a minimum, I’ll give them credit for that, but it’s not enough. I felt let down because the video talked the talk of empowerment, but didn’t walk the walk when delivering the end product. I would have loved to have seen a different colour pallet, a pallet that didn’t pander to girls or boys. I’m presuming that GoldieBlox did their homework, and that market research and focus groups indicated a strong purchasing power of the pastel colour pallet. But hey, if they couldn’t clear the music for the video, who knows? 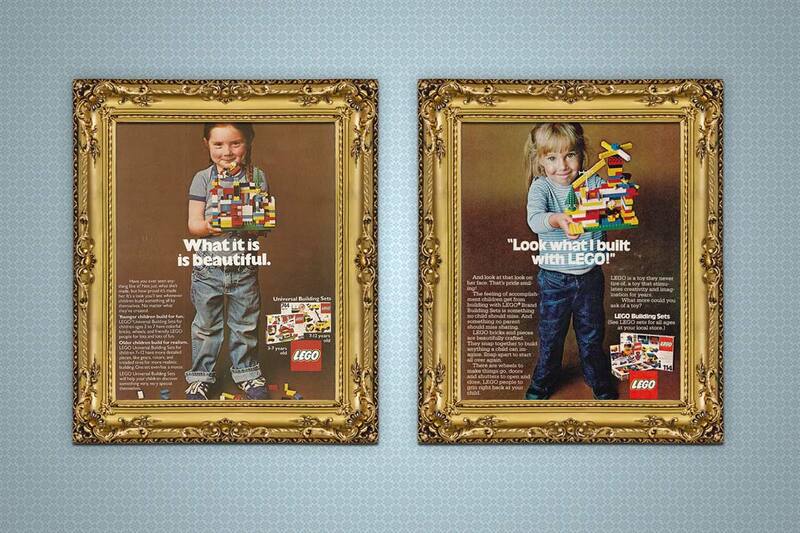 Then I remembered an old Lego ad that hit the spot. It had a young girl with pigtails and a very proud look on her face holding up her latest creation. It’s a great ad, no question about it. Best of all, there was no pandering to the marketplace with pastel or gender-biased colours. It makes perfect sense; the end-product of a happy and creative child should be enough. I wish that GoldieBlox stayed true to their motto of “disrupting the pink aisle” (which I quite like) instead of dabbling within it. Hopefully it will over time, because we still have a long way to go. After all, if Lego can do it in the late 70’s and the early 80’s why can’t we do it now?